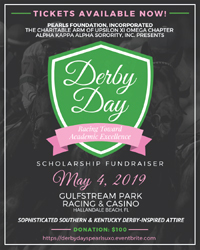 The PEARLS Foundation, Incorporated, the charitable arm of Upsilon Xi Omega Chapter of Alpha Kappa Alpha Sorority, Incorporated, is pleased to announce our annual Derby Day 2019, “Racing Toward Academic Excellence”. This celebration will take place Saturday, May 4, 2019, from 11:30 a.m. – 6 p.m. at Ten Palms in Gulfstream Park. Guests will have full access to two full gourmet buffets, a complimentary welcome drink, cash bar, the viewing of continuous horse races and the culmination of the 145th Kentucky Derby Race at 6:30 p.m. There will be door prizes, raffle tickets and auction items. Winners will have the opportunity to meet the winning jockey. Attendees are encouraged to dress in DERBY attire with hats, gloves, sundresses, fedoras, and bowties to create the excitement of the atmosphere. This exquisite event is $100. In addition, guests can take advantage of additional amenities on Saturday that include shopping at the exclusive Gulf Stream Shoppes, Spa services, Casino gaming or simply eating, drinking, relaxing and watching the races. Hope to see you there.